Inspired by Mr. Willem Bouwmeester's encouragement "The International 70mm Association" - a promotion club for 70mm film - was founded in 1988 by Mr. Johan Wolthuis in The Netherlands. "Encourage film makers to produce and make new films in 65mm, present them in 70mm with 6-track discrete digital sound on big curved screens". "The 70mm Association Newsletter" was the "voice" of The International 70mm Association. 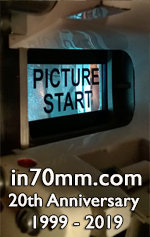 The magazine title was changed a couple of times, and "in70mm.com", is the latest incarnation of the newsletter. 25 years after the first issue was published, all issues from #1 to #35 have been added to the on-line publication page issuu.com AND as direct downloads from in70mm.com as PDF files for your enjoyment. See the links below next to each magazine cover. All articles are available on-line. Issues 1 - 36 are usually 8 pages and mostly photocopies of other articles. 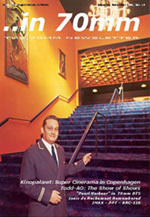 Issue 1 - 35 was published and edited by Johan C M Wolthuis 1988 - 1994. The web site editor took up the challenge of editing The 70mm Newsletter when Mr. Wolthuis (Holland) passed on the task to Thomas Hauerslev (Denmark) in late 1994. The magazine was never a commercial venture - nor was it intended to be. It had a lot of fans and the number of subscribers climaxed in 2000. The last issue was published in the fall of 2001 when the editor decided to stop for a number of reasons. Special edition issues #68 - #70 have been made for the Widescreen Weekend. For 7 years, when the magazine was produced regularly, it was edited and published in Copenhagen. It didn't change a world, but it was a player on the international scene of 70mm film fans. • "Along the Abondoned Road" short in Super Panavison 70. • Does life begin at 65mm? • Mark Magidson on "Baraka"
Todd-AO Mark III printer principle. Review: New York Times "Oklahoma!" Visit to the set of "Hamlet"
Credits: "The Miracle of Todd-AO"
Credits: "The March of Todd-AO"
Credits: "Svalbard - Arctic Seasons"
Credits: "Warriors of the Wasteland"
Todd-AO: How it all Began, part # 4. 70mm films 1896 - 1997.
Letters: "Exodus" and "West Side Story"
Letters: "Around the World in 80 days"
70mm Meeting in Aalborg, Denmark. Time Traveling to the New Neon. Introduction to "Orpheus in the Underworld"
Credits: "Blackadder Back & Forth"
Filming: "Rheged: The Lost Kingdom"
2000 Egyptian Theatre 70mm Festival. Credits: “2001: A Space Odyssey"
Filming of "A Year Along the Abandoned Road"
Will IMAX fade to Black? Book review: "So You Wanna be a Director?" New 70mm print of "It´s a Mad, Mad, Mad, Mad World"